Sofas are necessary in every home, but they often don’t get the attention they deserve. Many houses are filled with usual and plain sofas, but an interesting sofa design can enhance any room! Why settle for normalcy when there are so many wonderful choices available today? Some sofas can fit in any room, but there are unique sofas that only fit in a certain setting. In fact, there are unusual sofas that are works of art themselves! It’s worth exploring the many styles available to find something that works for you. You can go for a classic yet memorable design, or choose something that has never been seen before. Tip: An easy way to change the sofa design is by using a sofa slipcover – so many different options and colors. With so many sofas to choose from, you can make your rooms unique and engaging. While design is important, the most crucial part of a sofa is its comfort level. Any couch can look great, but it must be comfortable to be useful and worth getting. To find the perfect sofa, you should first imagine how it would work in your desired room. Some sofas are artful and amazing, but they may not work with every color or room style. Modern sofas should generally blend with modern surroundings. Artful sofas should not completely stick out in the room as well. You want the sofa to blend with your house’s design and other furniture and artwork. Of course, there are also some sofas that deserve to have an entire room devoted to just them! This guide will show you some of the most creative, cool, and inspiring sofas on the market today. Go through it and find something that brings you passion and joy. Plus, these sofas are sure to be as comfortable as they are cool! Check out these top 12 creative sofa designs to find the one you love most! 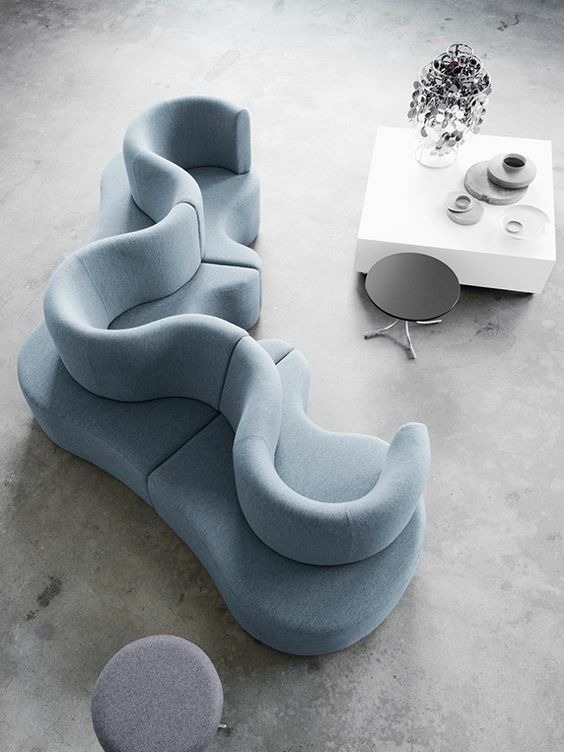 This baby blue wavy couch is perfect for offices, parties, and solo relaxation. The configuration maximizes space with its curved design. The configurable center also allows you to adjust for more or less people. The curves allow guests to rest their arms and have intimate conversations. For offices, this couch is a great way to stay trendy. It can look fantastic nearly anywhere. It provides room for guests without taking much space. The color and design is also similar to a relaxing ocean wave. As far as creative couches go, this is one of the best modern designs around! This plush pink couch is perfect for young girls and creative types! The couch is made up of different shapes and textures for an artsy look. Each separate shape is also a different material to make the couch extra comfortable. Soft pink mixes with carpeting, and the pink colors vary in a beautiful way. 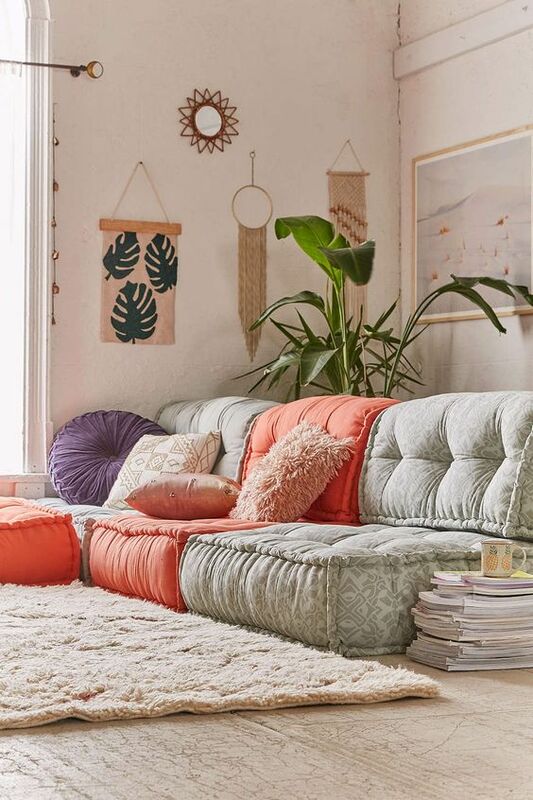 This couch is youthful, relaxing, and just plain fun. It would work well in a child’s room, bachelorette’s house, or in a side room for guests and games. For the daring, it could even be great as the centerpiece in the living room! 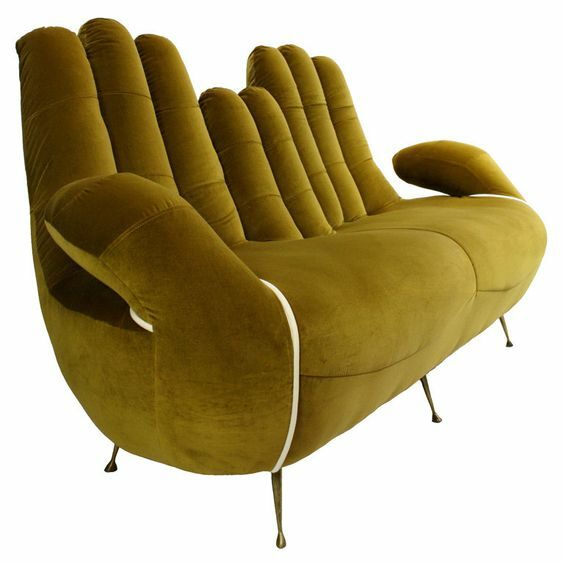 Inspired by the dreams of Dali, this great couch lets you relax in the palm of someone’s hand! The two hands come together to provide a comfortable headrest across the couch. The thumbs make for a great and unique arm rest. The olive coloring comes right out of the 1970’s, but the surreal style is completely timeless. From afar, the couch might even pass as a regular couch. Up close, the hand-style is apparent and memorable. This is a couch that inspires conversations and great times. Combine with shag carpeting and some peace signs for a far-out time! 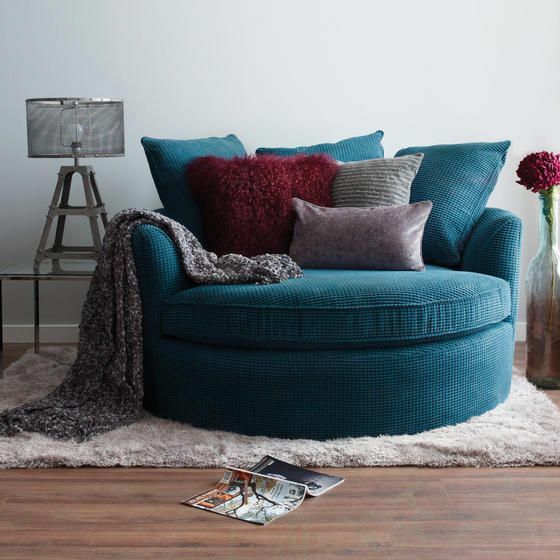 This soft circular couch hits all the right spots! It’s spacious enough for two yet cozy enough for one. Guests will enjoy talking and drinking while nestled in the pillows. If you want the evening to yourself, cozy up with a good book or rest peacefully with your legs up. This couch is modern but works well in any style of room. The blue color is gentle and attractive. The circular design makes multiple positions possible and comfortable. If you want the ultimate in relaxation, this is the couch for you! 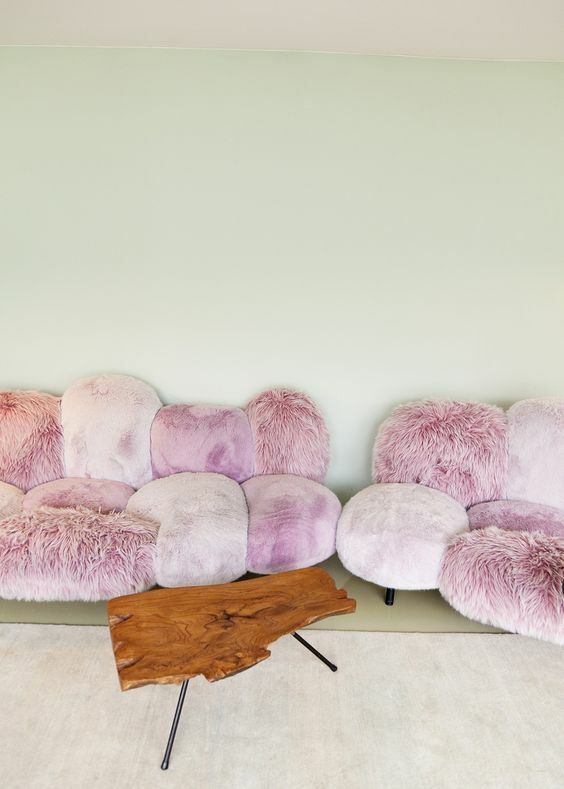 This pastel colored sofa has youthful buttons and a plush design. With colorful bow tie pillows, this amazing sofa is both artsy and comfortable! The classic design makes this couch appropriate for any setting. It works well in formal family rooms and children’s rooms alike. The pastel color is soft and soothing for a pleasant appearance. The armrests are slightly tilted to make reading or resting a pleasure. The design works for adults, children, and little princesses. This couch is guaranteed to delight in any room! This boho sofa is perfect for artists and homeowner’s with great taste! Boho is the latest furniture trend which originates from the Bohemian lifestyle. This sofa combines many colors, fabrics, and textures to great effect. This all creates the boho style which is artistic and free. This couch is bursting with creativity. The ragged style is subtle making it perfect for living rooms or bedrooms. It’s a style that works for any age group, and it’s timeless with its unique charm. Bring some Bohemian beauty into your home with this gorgeous couch! This puffy white sofa is modern yet inviting! The design is fluffy and looks like a soft cloud in the sky. The sofa rests low to the ground giving it a unique appearance while still being comfortable. The lowness of the sofa works well with nearby wooden stools. This sofa would work great in a white living room or in an office. Its casual nature makes it perfect for reading and relaxing. Its cloud-like appearance is also perfect for drifting away to the best dreams! This sofa is sure to spark your creativity and bring tranquility into any room! This soft bubble sofa looks too good to be true! Whether it reminds you of bubblegum, clouds, or soft cotton, it’s impossible not to love its youthful design. Each circular cushion is designed to be extra cozy. It all comes together to create a wonderful piece of art. This couch may not work in every room, but it will go well with modern houses or rooms filled with modern art. It’s stylish and minimal, and nobody can resist resting on its soft design. You will always be in a great mood when sitting on a couch like this! This sofa is fit for a Queen. The soft pink fabric is joyful without being too bright, and the light oak legs contrast it beautifully. Little frescoes are carved into the wood giving this sofa a timeless appeal. While the sofa wouldn’t look out of place in a museum, it’s subtle enough to fit in any modern household! It works as a relaxing sofa in the office, family room, or as a reading spot in the bedroom. Little princesses will also love this chair and its charming fairy tale beauty. While the style is classic, this is a sofa that works in any era! 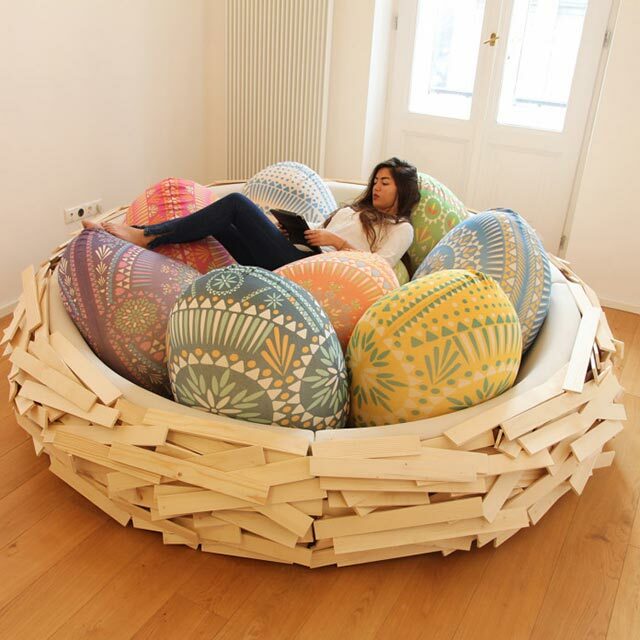 This bird nest sofa is one of the most creative designs around! The outside is made of scattered wooden boards to look just like a bird’s nest. 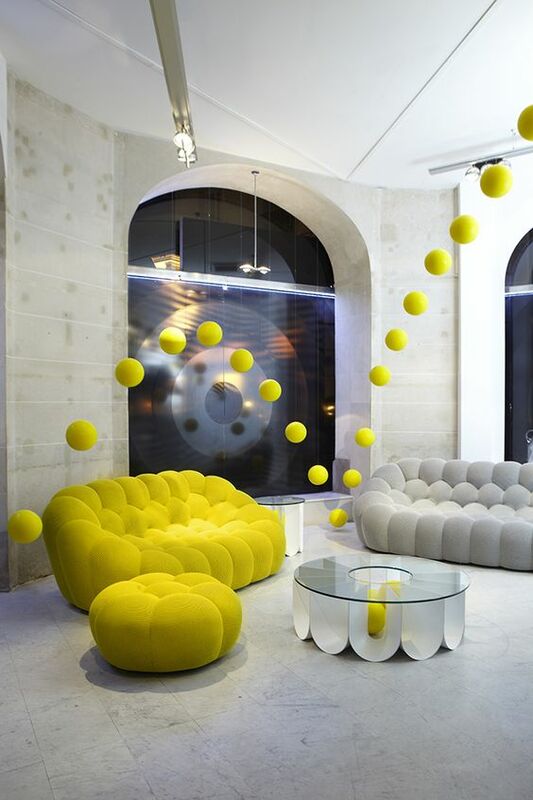 Inside, the soft circular sofa is filled with colorful egg-shaped pillows to complete the effect. While it may be unconventional, this sofa could not be more comfortable! What’s better than falling into a nest full of soft pillows after a long day? You can rearrange the pillows to your liking, or you can fill the nest to the brim for maximum softness. This sofa is a guaranteed conversation starter, and it’s perfect for all ages! It may be large, but it’s easily the centerpiece of any room! Watch a drive-in movie in your own living room with this eclectic couch! This couch drove straight out of the 1950’s and is perfect for kid’s rooms or for watching movies. It features red and black cushions for a wonderful contrast. The sides copy the best of the classic Corvette style. This couch is sure to enhance any movie night, and it begs to have popcorn and candy resting nearby. Even the sternest adult will feel like a kid again on this crazy sofa. 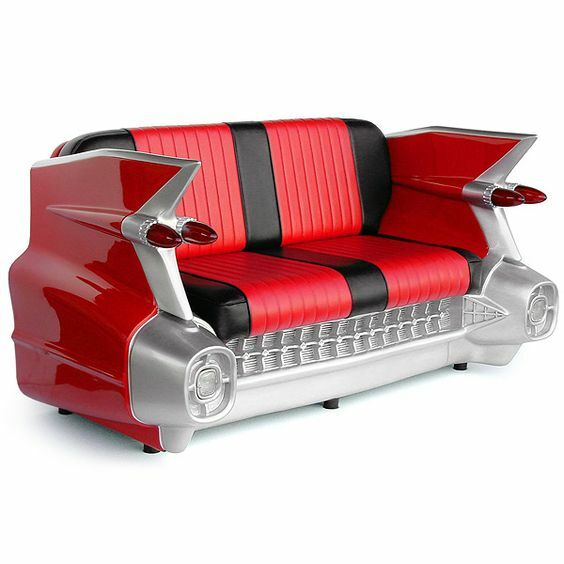 Call up Peggy Sue, grab a cherry soda, and transport back in time with this cool couch! 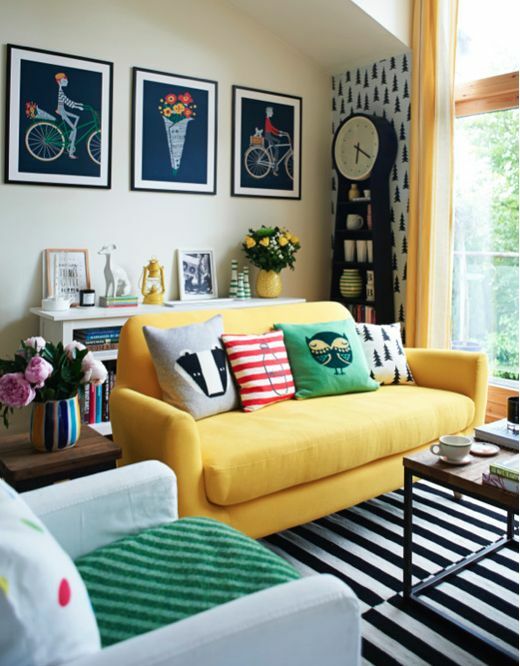 This soft yellow sofa is both classic and comfortable. 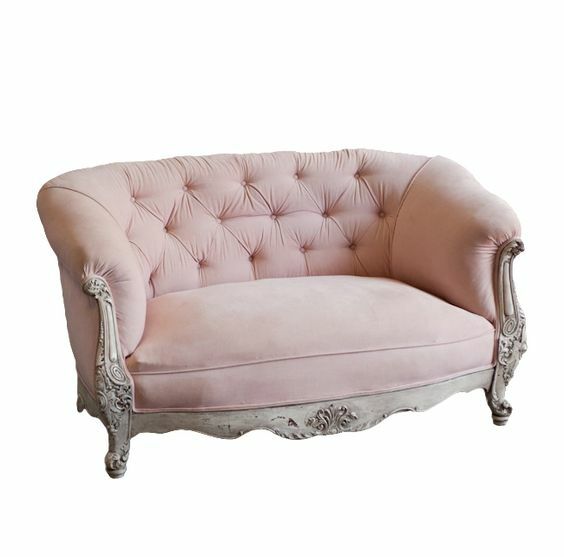 This is a couch that works in any room, and Audrey Hepburn would fit right in on this lovely design. It uses simplicity to its advantage to create a warm and approachable design. There are no extra frills here to be found, and that’s what makes this couch perfect. It feels nostalgic, yet it’s modern enough to never be out of place. With some artful pillows, this couch can fit any style and personality. The rounded edges also make the couch perfect for relaxation and enjoyment. This is the ideal sofa for peace and a room without clutter!